My family and I have never been on a real cruise. My husband and I have done a repositioning cruise once but that’s where our cruising experience ends. We’re going on a Norwegian cruise with a large group this spring and are so looking forward to it. 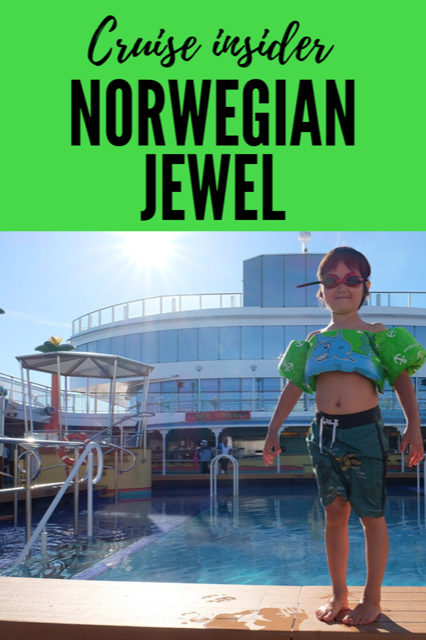 This past weekend, Norwegian Cruise Lines invited my family to get a taste of what a cruise is like by boarding the Norwegian Jewel while it was in port in our city. How could I pass this up? A Friday afternoon of fun at the pool and a tasty meal at one of the Norwegian Jewel’s main restaurants sounded great. We all made our way to Ogden Point in Victoria, BC after school on Friday and boarded the (huge to us) Norwegian Jewel. Our guide, Cindy met us at check in and gave us a thorough tour of the ship. My family loved getting the tour and learn tidbits about the ship from Cindy. The kids were in awe when we checked out the theatre and walked through the casino. We also loved the tranquility of The Haven and the view from the top deck (for VIPs only). Our most memorable experience was our time at the pools. My son went nuts on the slide and went down about 50 times. I loved that the slide wasn’t too fast (yes, I went down a few times) and landed in a shallow pool. We also loved hanging out in the hot tubs and jumping in both pools. It was a lovely way to spend a Friday afternoon. Our evening ended with dinner at Tsar’s. We were seated at a beautiful table right by the window with an unobstructed ocean view. Our server was attentive and made my children feel so comfortable. My kids loved ordering from the kid’s menu and my husband and I enjoyed a wonderful three-course meal from the main menu. Perhaps the most impressive part of the meal for me was when our server noticed that my son was devouring the broccoli from my dish. He pointed it out and asked if my son wanted his own plate of broccoli. My son gratefully agreed and soon enough a plate of steaming broccoli was served to my big boy. My family really enjoyed our afternoon on the Norwegian Jewel. It was a great way to give them a taste of what our spring cruise will be like. I look forward to sharing our full cruise experience with you this spring! I’d love to know, have you been on a cruise with your family? What was your experience like? I’ve never been on a cruise but it looks like it would be a lot of fun. Thanks for the wonderful review,the food looks so amazing! incredible! One day we’ll go on a cruise! We have never been on a cruise, but would love to go someday! The Norwegian Jewel looks amazing! We would love to go on that cruise line. We’ve never been on a cruise but this place looks fantastic! Beautiful pictures! Looks amazing! Would love to experience this. I’ve been on two Caribbean cruises, Alaskan cruise and a Mediterranean cruise and enjoyed all of them for different reasons. I would LOVE to take another cruise one day. We find them very relaxing because you can be kept busy if you choose to when in port or cruising – or take time to chill and enjoy the ambiance. We’ve only been on one cruise and it was noisy! I hear Norwegian is more laid back, and that’s what we want! Looks like a luxurious time for sure, I love the idea of taking off on a cruise and enjoying some down time with the family! I’ve never been on a cruise, but I keep hearing it doesn’t even feel like your on the water! Sounds fun. That looks like a fun ship for the whole family and that pool was much larger than I’ve seen before! Can’t wait til you share more! I have never been on a ship, but it sounds so wonderful, one of these days I would love to go on a cruise!! Our family hasn’t been on a cruise either. Looks like fun!